With the new Bookassist booking engine customer interface hotels can now do much more with their images than even before. We are always banging on about “reducing friction” (simply making it easier for the customer to get where they want to go) and using bold graphics can help in clearly pointing the guest to the packages type and room type they are seeking. We’ve recently redesigned the booking engine pages at The Old Manor Hotel in Fife and in a differnet way for Ducks at Kilspindie in East Lothian to match their new websites and the results as shown below make it so much easier for the guest to understand what they are looking at. 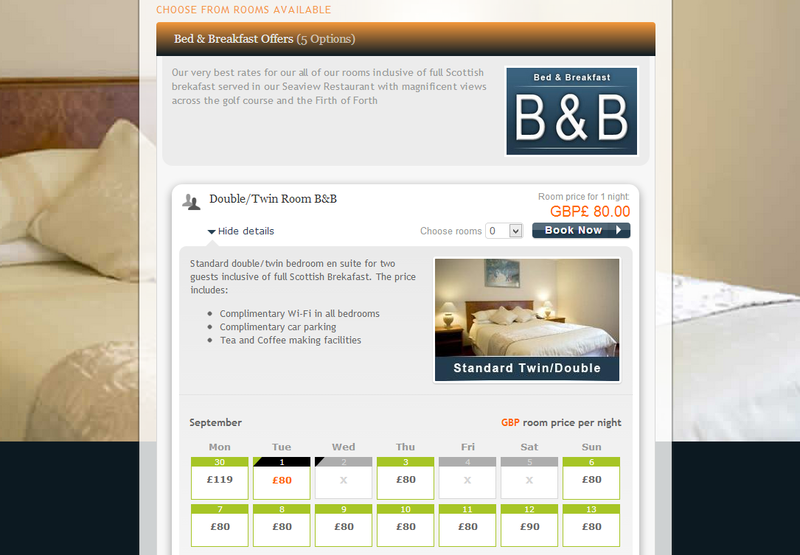 The Bed and Breakfast title bar is reinforced by the B & B button while the specific room pictures below all have descriptive titles on them. With accompanying text and integration of the correct colours and style and the two week calendar view the impact is increased dramatically and the guest can easily understand what they are viewing. If you wish to personalise the set-up of your booking we can create site specific buttons in the style and design of your website for only £95 plus VAT for twelve buttons. Download PDF version or contact your account manager, e mail Scotland@bookassist.com or call us on 0845 1501314. The SGU, working in partnership with Scottish Enterprise and Event Scotland, [sic it is all one word!] has commissioned KPMG to conduct an exercise to assess the economic value of golf in Scotland and, importantly, the prospects for the future. We would appreciate your contribution by participating in our survey at the link below, which should take no longer than 2 minutes to complete. Your views are vitally important to the success of this project. Okay, when you see the email's from these four bodies you think this may be important. It certainly adds gravitas. You would of course assume that an industry survey sent out to golf businesses across Scotland ahead of a major seminar to discuss golf (10th annual Golf Business Forum in St Andrews from 3 to 5 June 2013) and supported and perhaps even funded by public money would have been proof read? There is a sense that the survey has lost something, shall we say, in the translation. This is not however the fault of the Hungarian market researcher who has sent it out but you would have thought that maybe someone would have picked it up at one of the three esteemed bodies associated with it!! Where do you start? the use of the word "loss" instead of reduction? A ranking list where everything can be ranked as 1? The Americanised spelling of Programs? The misspelling of "associations" in a drop down list? 4. Assuming significant ongoing governmental support for the golf industry, what is the maximum growth you would see achievable on industry level? As the wag points out, the oxymoronic phrase is pretty clear... "significant ongoing governmental support". The point of the post? Well as someone who gets lots of spelling wrong but usually without the support of the SGU, Scottish Enterprise and EventScotland it just seemed fair to point out that if inclusion and involvement of the industry is important then respect should be given to the intelligence of the audience being engaged with. Yes you could argue this whole post is pedantic. The flip side is you could say it is reflective of the collaborative malaise. 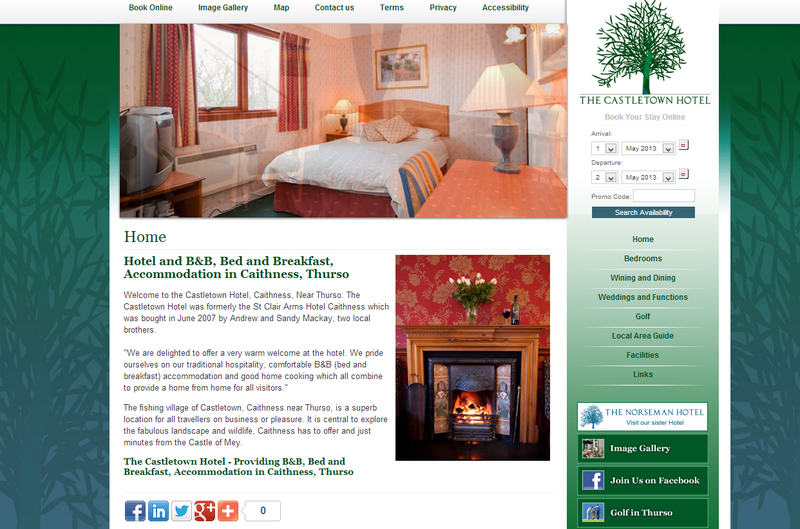 We are delighted to have put live the new website for the Castletown Hotel, Caithness, Near Thurso. The Castletown Hotel was formerly the St Clair Arms Hotel Caithness which was bought in June 2007 by Andrew and Sandy Mackay, two local brothers. "We are delighted to offer a very warm welcome at the hotel. We pride ourselves on our traditional hospitality, comfortable B&B (bed and breakfast) accommodation and good home cooking which all combine to provide a home from home for all visitors." The website is based on one of the Open Rooms Lite Frameworks that we have developed for 2013/14 and has the award winning Bookassist web booking engine fully integrated. 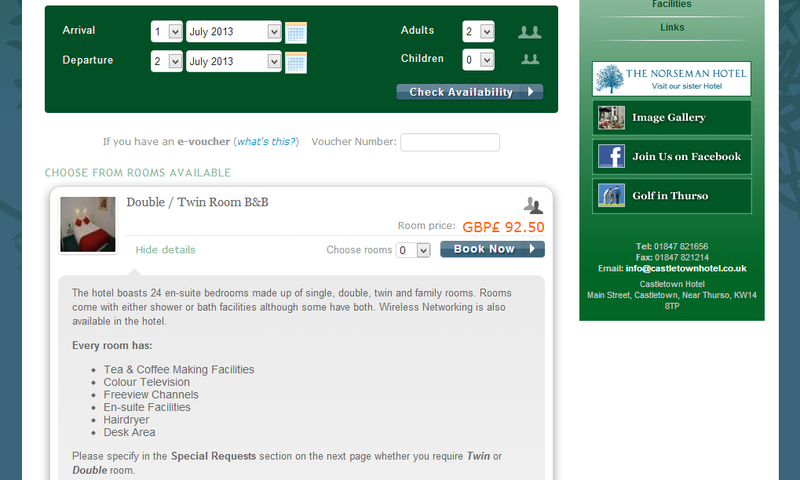 The integration includes designing the booking page and buttons to complement the website itself. This is just one of the major improvements in the Bookassist offering over the apst few months. The content management system powers the whole website and means that even small operators can control their crucial content and online reservations simply and cost effectively. Open Rooms lite website packages start from only £795 plus VAT and can be live within a fortnight complete with the Bookassist booking engine. Download the Open Rooms Lite PDF information here or email us for more information.